Article corrected and revised April 18, 2016. The structure, referred to as the Johnson-Turner House was not built for nor owned by George W. Johnson as earlier reported. 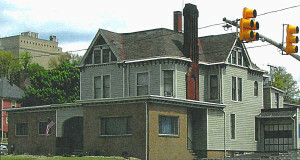 The Johnson-Turner House is a Victorian built in approximately 1888. Its appearance, although hidden by additions, exhibits typical Victorian construction. The asymmetrical shape includes wood siding, decorative trim, a multifaceted roof, and a one-story porch. It does not include towers that were often commonly included on Victorians, but does have bays facing several directions. The home’s first owner was M. Loy Hanna, a prominent business owner and talented musician. He worked with his father at J.C. Hanna and Son, a department store which featured jewelry, silverware, watches, pianos and organs. George W. Johnson moved into the home with his family in 1893. Although he did not purchase the home, the family lived there for ten years. Johnson was born in Mercer County near Clarksville. At age 10, he worked in coal mines for Wilson, Land and Company. He began clerking at the company store, and by age 16 was put in charge of a department. His ambitions continued, and he later acquired his first limestone company with A.R. Lee and William Patterson. Johnson married Elizabeth Osborn in 1868. When George Johnson moved to New Castle about 1880, he started out in retail, and lived in several small residences with his wife, Elizabeth, and two young sons. They were members of the First Methodist Episcopal Church and Mrs. Johnson was socially active. She participated in the church’s Social Union as well as the Red Cross. The house welcomed many visitors, including members of the Tuesday Night Euchre Club and Lincoln Club. The New Castle News referred to Johnson as one of New Castle’s “Princes.” Johnson either invested in or owned over twenty limestone companies located in Lawrence, Butler, Armstrong, and Blair counties, as well as in Maryland and West Virginia. He also had extensive coal interests and was invested in rolling mills. In 1901, he formed the American Car and Ship Hardware Manufacturing Co. which eventually expanded into Johnson Bronze with his sons William L. and Charles H. Johnson. Johnson was an equal in stature to steel tycoon Andrew Carnegie and coke magnate Henry Clay Frick. In 1903, Johnson attended the Carnegie Annual Banquet with 70 other important executive of the day. His investments made New Castle the center of America’s limestone industry. In 1902, the property changed hands. Mrs. Hannah Irwin of Wheeling, through her agent, David Dickey, purchased the land from Mr. Hanna. She subsequently sold it to the First Methodist Episcopal Church for a parsonage in 1903. At that time, the city was so accustomed to the house being the Johnson family home that a New Castle News stated: “The First Methodist congregation will purchase the George Johnson residence on North Jefferson Street for a parsonage …” Mr. Johnson moved to his new residence on Highland Avenue early that year, and remained there 15 years until that house was sold to Dr. R.A. Wallace in 1918. The house was owned by Boyd Funeral Home in the 1930s. It became Myers Funeral Home in the 1970s and eventually became Turner-Myers by the mid-1980s. It is currently a Turner Funeral Home.